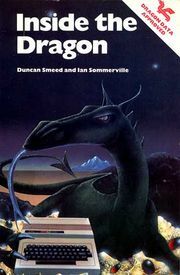 The book was written by Duncan Smeed (Dragon Data) and Ian Sommerville (University of Strathclyde), was considered by many to be the 'bible' of programming the Dragon. The book was initially criticised for being published too late (late 1983) but don't let that put you off, from what is a fantastic book. The book is in complete contrast to 'Dragon Magic' and is aimed squarely at the advanced programmer, being mostly machine code and hardware orientated. Calling all DRAGON owners If you have ever wanted to get more from your machine, but have been held back by a lack of documentation on its internal hardware and software, INSIDE THE DRAGON is the answer to your problem. The authors have assembled in this book a wealth of information not previously available in one place. No one who wants to do more with their Dragon than merely play games can afford to be without it. Also included in the book are the manufactures data sheets for the MC6809 processor, the SN74LS783 multiplxer, the MC6847 video display generator, and the MC6821 interface adaptor; invaluable aids to the serious user. The Dragon is similar in many areas to the Tandy Color Computer so owners of that machine will find plenty in the book to interest them also. This page was last modified on 4 June 2010, at 14:50.